This beautiful property of about 2 ha is located in the Municipality of Rosignano Marittimo in Livorno and extends on the edge of the natural protected area of the Chioma torrent. The elegant Villa of 450 sqm is situated on the hills and one can easily reach the sea by a green hilly road of 5 km. At the end of the road there is a comfortable, quiet bathing establishment with all comforts and adjacent to a small seaside resort called Quercianella, awarded with the "Blue Flag". The Villa is surrounded on three sides by a large porch overlooking the garden. The basement consists of a kitchen with a wood oven, service rooms and a bathroom. On the ground Floor one finds a large quadruple room with a fireplace, a large kitchen with a second fireplace, a bedroom and a bathroom. The entire surface is with Tuscan terracotta flooring. Always on the ground floor there is a semi-detached apartment composed of a nice lounge with a bedroom and bathroom. 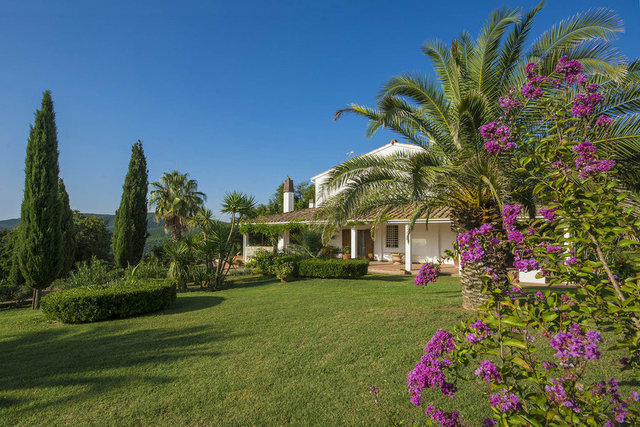 On the first floor there are four beautiful bedrooms with parquet floors and wardrobes, four bathrooms, a large panoramic terrace where one can enjoy the view of the garden and the sea on the horizon. On the second floor is the attic. The 2 ha surrounding the house are completely fenced in to ensure maximum privacy and security. A small source of depurative water is located within the property. The whole property is facing the west side, so it is exposed to sunlight throughout the day. The villa has a spectacular view of the sea and the green of the surrounding hills with a vegetation of Mediterranean scrub, from which one can admire some islands of the Tuscan archipelago and, on the clearest days, also the island of Corsica. The climate is predominantly mild in winter and cool in summer. The property is 15 km south of Livorno, just 5 km from the sea of Quercianella and 10 from Castiglioncello, 100 km from Florence, 50 km from Lucca, 60 km from Forte dei Marmi, 60 km from Volterra and 35 km from Pisa where the international Airport is located. Just 2 km from the property, there is the village of Nibbiaia where there are 2 restaurants, a tennis club and various shops: a small supermarket, a bakery, a butcher, a pharmacy and a doctor.